Julie Gichuru has been slaying a lot on instagram to a point many are left thinking she might be a 30-something year old enjoying her money. To be honest, the former Citizen TV news anchor has been blessed with looks of a 30-something-year-old though she’s on her way to 50s. However, some believe Julie Gichuru’s husband of 19 years looks even younger than her. Julie is now 45 years old. 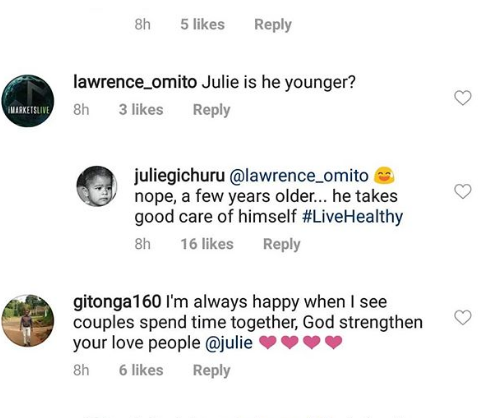 On Instagram, Julie had to explain to a follower that her hubby, Anthony Gichuru, wasn’t younger than her after the fan brought up the question. #BaeTings by @khalifa_louie ” said Gichuru on a photo of the two. A fan then asked whether her man was actually younger than her. “No, he isn’t younger. He is a few years older. He takes good care of himself,” she replied.